The champion of the champions The Ruby Fortune has proved to be an Online Casino with enormous potential. The award-winning Virtual Casino has proved a firm favourite amongst online gamblers since its arrival in May 2003. There are 138 games to choose from including over 60 Slots, and a large selection of Video Poker, Blackjack, Roulette, Baccarat, Craps and several progressive games including Major Millions which has jackpots that regularly exceed $1,000,000. The Casino Web Site uses Viper software, the latest edition of the Microgaming casino software, which is the most advanced of its kind. The Viper platform introduces a range of groundbreaking games as well as a some new innovative features. These include 'Auto Play' that allows you to select the number of hands or spins to play and then plays them for you flawlessly and 'Expert Mode' that allows the software to automatically play the best strategy and prompt you if you've made a mathematically unsound decision. Other useful features include 'PlayCheck' that shows a complete transaction history of every wager that has been made by the player. The Viper software is available in downloadable form or as an instant play flash casino and players have the chance to play for free with a 'Guest' account before registering a 'real' one. Players can wager in four different currencies ($, £, Euro, CA$) and there are a wide range of deposit options including Neteller, Switch, MasterCard, Visa, Firepay, Delta and others with all payments being processed in a secure environment by Proc Cyber. A full breakdown of monthly payment percentages are available that have been reviewed by an independent auditor and the site is fully licensed by the Kahnawake Gaming Commission. On opening your account you will receive up to a 125% bonus. This is not the top bonus you can get when you sign up on a site but it’s surely above the average of the industry. 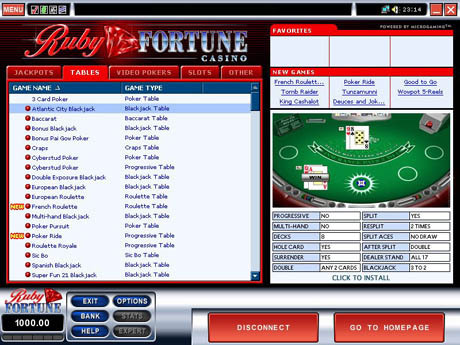 Ruby Fortune allows players to enjoy their many games in dollars, pounds, or euros. For the player's protection, all transactions and game sessions on Ruby Fortune are recorded for a complete audit trail. Ruby Fortune has great technical support that is available to help players with their problems 24 hours a day, 7 days a week. Players entering Ruby Fortune online casino can rest assured that they are entering a top notch establishment that is offering a truly outstanding experience. Another plus is when you join Ruby Fortune you have the option of either downloading and installing the software or taking the No Download option. Ruby Fortune is currently offering a free $100 to any player who deposits an initial $80. That’s an astonishing 125% matching bonus to make players’ first experience at Ruby Fortune a great one. Players also can’t go wrong with Ruby Fortune’s amazing loyalty club; players get free money if they wager enough and stay long enough. There are no less then 138 + games to choose from including over 60 Slots, and a large selection of Video Poker, Blackjack, Roulette, Baccarat, Craps and several progressive games including Major Millions (one of our favorite) with jackpots that often may exceed $1,000,000. You have the chance to play as a guest, meaning no money is involved, until you feel safe enough to make your first deposit and open an account. The Video Poker is very nice and the game payouts are generally at the top end of online casino VP expected returns. The Jacks Or Better and the Deuces Wild Multi-hand on Microgaming casinos come out with the strongest odds of the online casinos featured on this site. If you play Video Poker and like either of those two variations, then play here. "Aces & Faces" also offers above 99% payout. Table Games: Baccarat, Blackjack, Caribbean Stud Poker (Cyberstud), Craps, Keno, Poker Pursuit, Red Dog, Roulette, Scratch Cards, Sic Bo (Big & Small), Slots, Video Poker: Aces & Faces, Deuces and Jokers Wild, Deuces Wild, Double Joker Poker, Jacks or Better, Jacks or Better Power Poker, 9/6 Jacks or Better, Joker Poker (Kings or Better), SupaJax Progressive Jackpot, Tens or Better, Triple Play (Or More) Video Poker, Double Down Video Poker, Progressive Jackpot, Video Poker: Aces and Faces, Deuces Wild, Jacks or Better, Tens or Better, Slots: 7 Oceans, Big 5, Cosmic Cat, Crazy Crocodiles, Double Magic, Fantastic 7's, Jackpot Express, Pirate's Paradise, Trick or Treat, Progressive Slots: Cash Splash, Lotsaloot, Wowpot, Fruit Fiesta, Treasure of the Nile, Progressive Poker: Supajax, Bonus Screen, Lucky Charmer, Slots: 5- Reel Drive Slots, 7 Oceans, Big Top, Cash Crazy, Cool Buck, Cosmic Cat, Cracker Jack, Crazy Chameleons, Crazy Crocs, Double Magic, Fantastic Sevens, Flower Power, Gopher Gold, Golden Dragon, High 5, Jackpot Express, Jurassic Jackpot, Monster Mania, Oriental Fortune, Reels Royce, Reel Thunder, Spectacular, Thousand Islands, Winning Wizards, Zany Zebra. Incredible software, outstanding casino games, efficient payouts and a very professional and well behaved technical support team make Ruby Fortune a must-visit for all online gamblers.